To manage your website's menu and page attributes, log into your Admin Page and go to Website Settings / Web Pages & SEO / Web Pages. 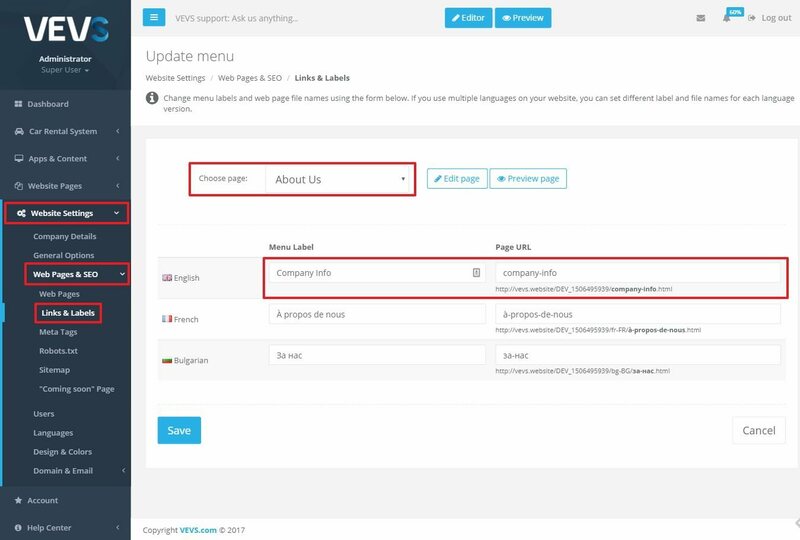 On this settings page you will see all available pages on your website along with their URL addresses and their current status (ON/OFF). You can select which pages to show or hide from your website by switching the "Use page" option (the green "ON" button means "active"). You can also edit each page's URL name and label. Just click on the "Link & Label" button next to each page to customize them. For example, you may want to change the "About Us" page label and URL to "Company Info" and "company-info" respectfully. The possibility to add descriptive page labels and links is good for your website's SEO and will ideally help your website to rank higher in the search page results when customers look for the products and services listed on your website. You can also set "Meta Tags" (i.e. 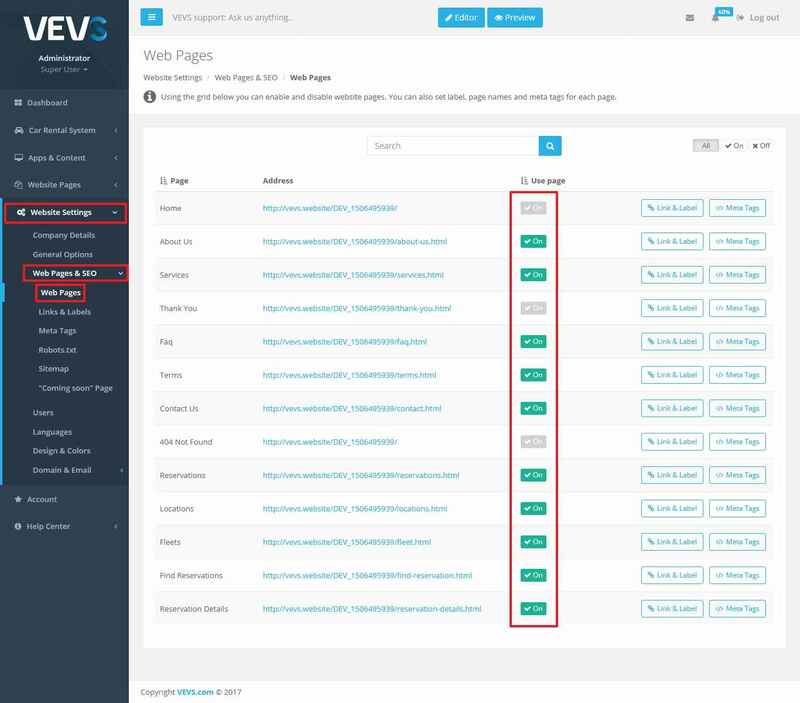 text elements describing the contents of each web page) in all languages you have enabled on your website. Just go to the respective sub-menu and pick the page you want to edit from the dropdown menu. If you intend to transfer your website on your own domain name and want to inform your customers about the change, you can enable the "Coming soon" page. Just go to Website Settings / Web Pages & SEO / "Coming soon" page and follow the instructions in the screenshot below. 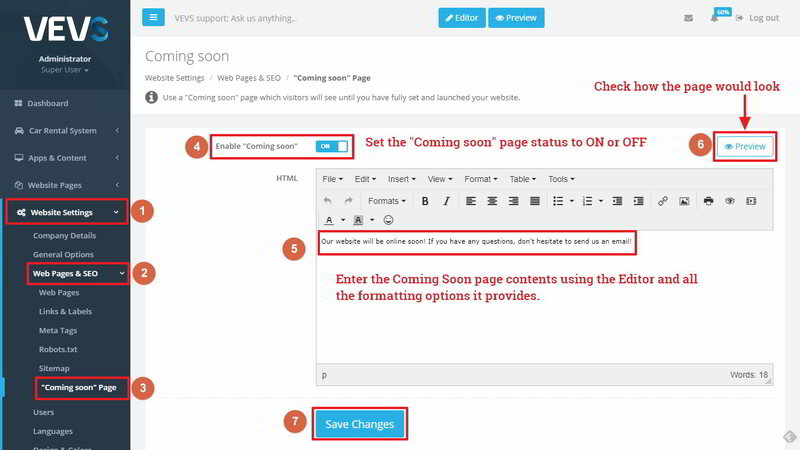 You will still be able to continue configuring your website settings and pages through the Admin Page, however, your visitors will only see the "Coming soon" page when they visit your website. Once you are ready to launch your newly transferred website, just disable the "Coming soon" page.